To Palu and Eski Palu. Before breakfast I walked to the ferry terminal to put the previous night’s empty beer bottles into litter bins, then went to eat in the garden of the hotel overlooking the reservoir. The sun was shining. As I waited for the food and tea to arrive, I looked at the roses in the flower beds. A man arrived in the garden and sat a few tables away. Three friends soon joined him for breakfast. Borek replaced the chips of the morning before and there was an excellent jam made from what looked like blackberries, but the fruit was karadut, or black mulberries. Once again, honey was in the comb. 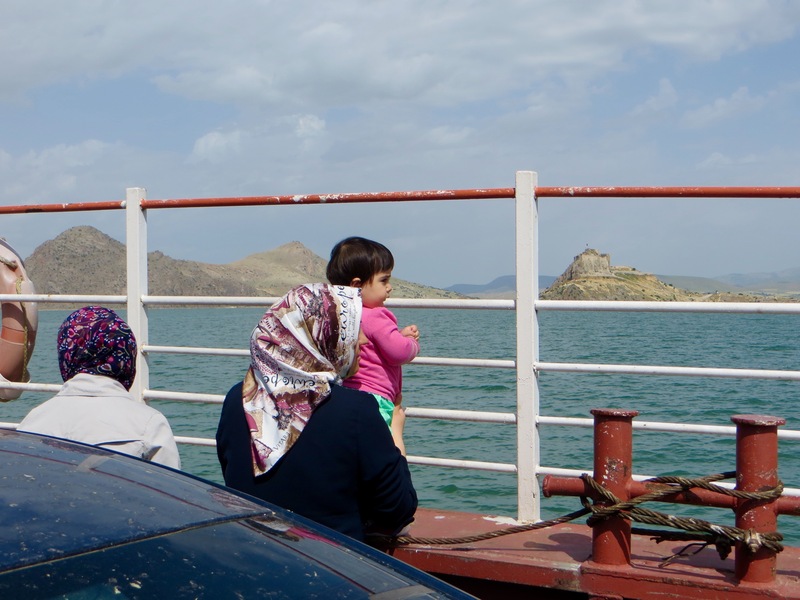 I packed the last few things into my bags, paid the bill, thanked staff for what had proved a delightful stay and walked to the ferry terminal knowing I could find a seat in one of the five or six minibuses for Elazig that had arrived for the next crossing. However, as we waited for a ferry to arrive (two ferries make the crossing all day long timing their departure so they set off at almost exactly the same moment, but from opposites sides of the reservoir), I chatted with a man driving an almost new Volvo. 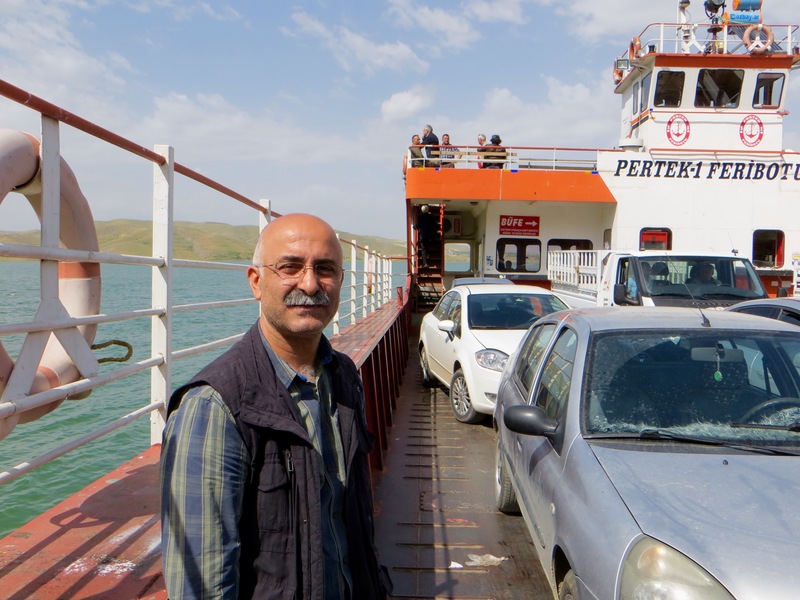 An Alevi with the usual misgivings about Erdogan, the AKP and Sunni Muslims, he kindly offered me a lift to Elazig where he was undertaking a day’s business. Because Elazig was from where minibuses would take me to my destination for the night, Palu, I agreed without hesitation to join him. Once all the motor vehicles had been driven aboard, the ferry set off. Passengers could walk around the deck, which meant that the views of the castle and the reservoir were very good. I was not allowed to pay either my fare or for the car. The crossing took about only fifteen minutes and it did not take long to disembark. 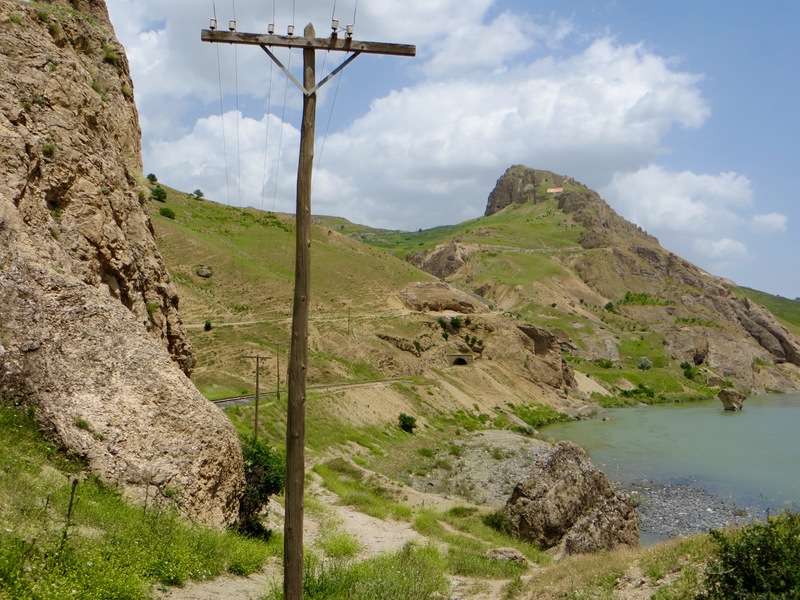 The drive thereafter was pretty rather than spectacular, but, as the car began to descend into Elazig, we passed a very large but incomplete hotel commanding extensive views over the city and the wide valley beyond. The ferry and Pertek Kale. The man who had given me the lift left his Volvo in a car park next to where minibuses depart for the minibus garaj serving towns and villages to the east. Because Palu lay to the east of Elazig, this was the garaj required for the next leg of my journey, so I got into the right minibus and, ten minutes later, asked from where I could find a service to Palu. In the fashion characteristic of the trip so far, a minibus for Palu was leaving in about five minutes. Perfection. Most of the journey to Palu was of moderate interest scenically, especially as we drove beside another reservoir with rounded hills to either side, but as we made our way into Palu itself, which lies beside the Murat Nehri with high mountains nearby, my spirits lifted. A steep, meandering descent from a plain into the town itself confirmed that I would enjoy what remained of the day. Some unattractive urban areas lay between Elazig and my destination, most obviously in Kovancilar where we turned off the main road to Bingol and Mus, but, although Palu is now overwhelmingly modern, its situation is stunning and it is small enough not to be much of a blot on the landscape. 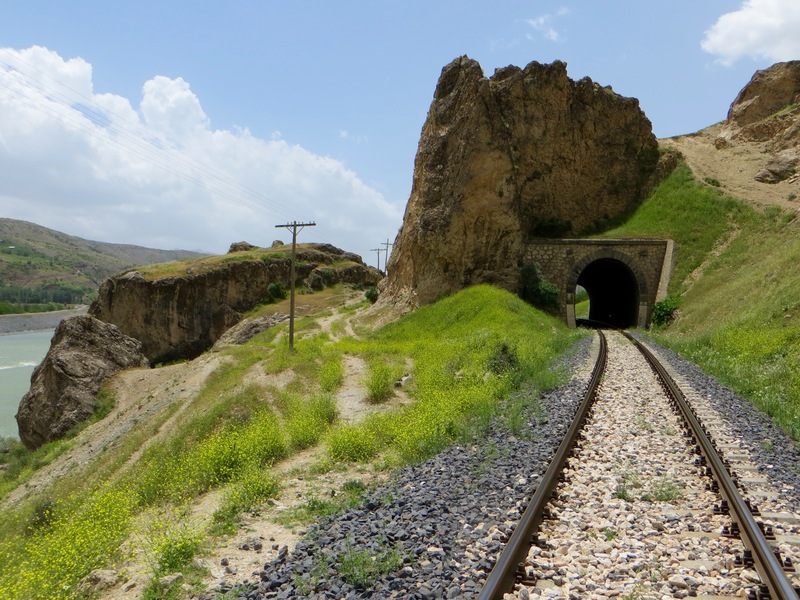 Moreover, because Palu lies beside the railway from Elazig to Mus and Tatvan, the small town is worth a detour even without the dramatic scenery and Eski Palu, the latter being the main reason why I was staying overnight. 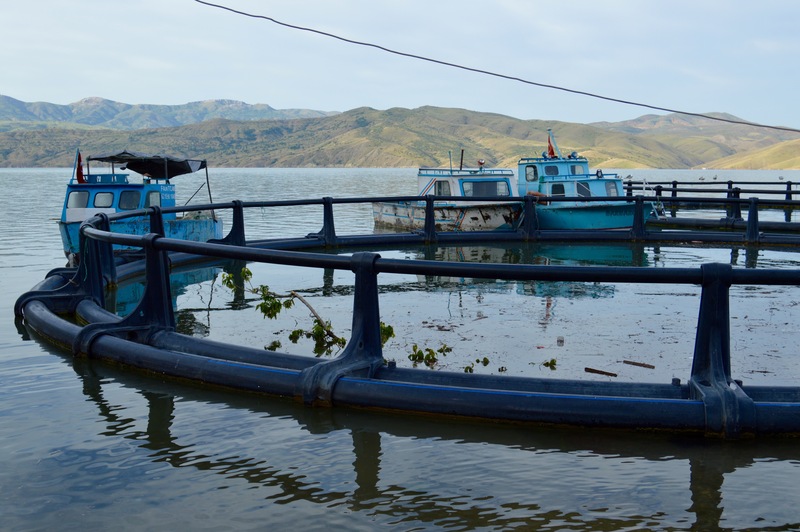 A search on the internet before leaving home suggested that Palu did not have a hotel, and this was confirmed by men at the garaj in Elazig from where the Palu minibuses depart. However, in Turkey even small towns have accommodation of some sort for visitors expected or otherwise, and the men at the garaj had assured me that staff at the ogretmen evi would put me up. Palu’s town centre is so small that the minibus terminated almost opposite the ogretmen evi, so I walked across the road to enquire about a room. A room was available because most teachers had departed for home. The term was almost over and exams dominated the working day, but only a few teachers were needed to supervise them. The manager of the ogretmen evi, who was summoned from the nearby large and very new Hukumet Konagi, showed me around the facilities (the facilities included rooms where games such as pool were played and a kitchen where breakfast was prepared), then he offered me a room with three beds near a smaller room with a sink and toilet (showers and more sinks and toilets were upstairs and easily accessed). I said how grateful I was for the room, which had lots of storage space, especially for one person, but was even more amazed when I was told that the room cost only 15TL a night. I said that the cost was very low and was happy to pay more, but more could not be accepted. I was in the middle of the town with the pazar, shops, businesses and lokantas nearby; the railway station was a few blocks to the south-west; and a road leading toward Eski Palu began near the Hukumet Konagi less than 300 metres away. I could not believe my luck. We drank tea, my passport was photocopied and a few personal details were committed to a ledger. I paid for the room in advance, then the manager led me to a small courtyard where the teachers could sit in the evenings drinking tea or soft drinks as they chatted with friends. From a tree the manager picked a green fruit not unlike a very small apple, but the fruit had a stone rather than pips inside. I bit into the sour but refreshing flesh, itself firm like an immature apple, and the manager gave me about twenty to take for my walk to, around and from Eski Palu. 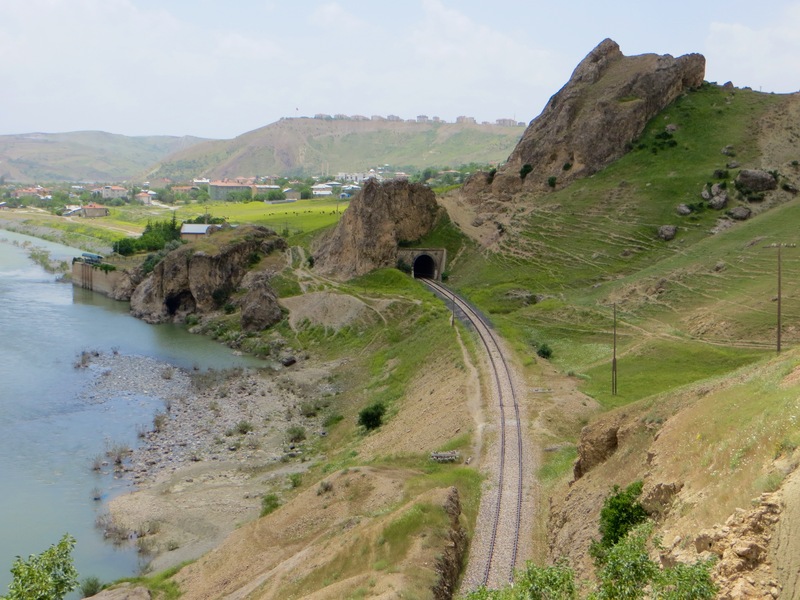 The best way from Palu to Eski Palu on foot (there is a way by car, but it is much greater in length and requires crossing the river twice) is to follow as closely as possible the railway going east, then, with some of the ruins now in sight, ascend a rounded hill aiming for one of the minarets. The centre of Eski Palu, which has long been abandoned and replaced by the town in which I was staying overnight, lay among and close to the ruins just mentioned, but the ruins of a citadel are found on the massive eruption of rock behind them. 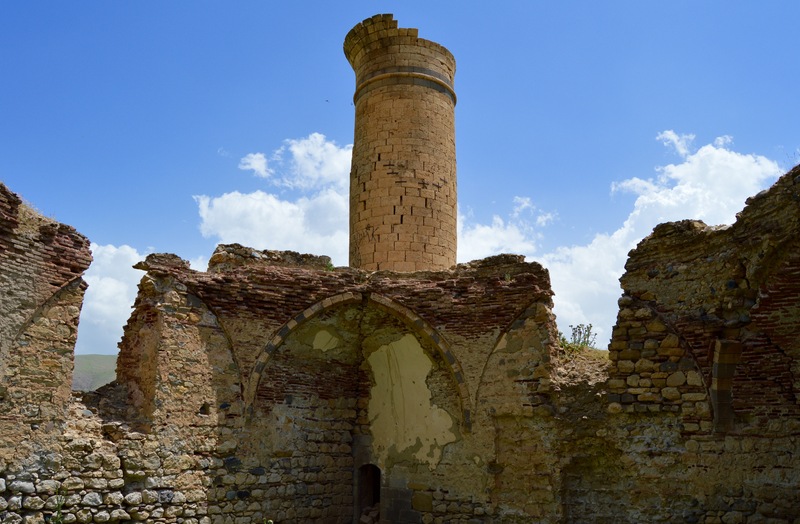 Eski Palu is a destination that deserves to be far better known and, as I was soon to find out, its ruins are more extensive and rewarding than those at similar but more famous places. View east between Palu and Eski Palu. Between Palu and Eski Palu. For most of the way to Eski Palu there are footpaths. Some of the footpaths are directly above the river with the railway to your left, and some are a little to the north with the railway to your right. However, all the paths eventually disappeared among new grass and late spring’s wild flowers. I had to ascend a hillside using for directions one of the minarets to keep me roughly on course. 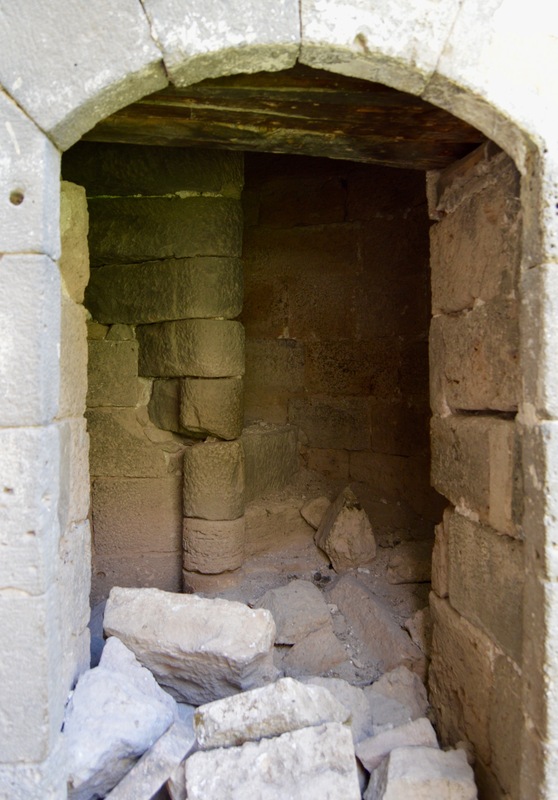 When I arrived on the more level ground that must have once been the centre of Eski Palu, there were the ruins of two mosques, a hamam and a cesme in close proximity and, some way to the east, a ruined church. High above me to the north were the ruins of the citadel. The ruins of the hamam were the most impressive and they were the ones most obviously benefiting from a lengthy restoration project. 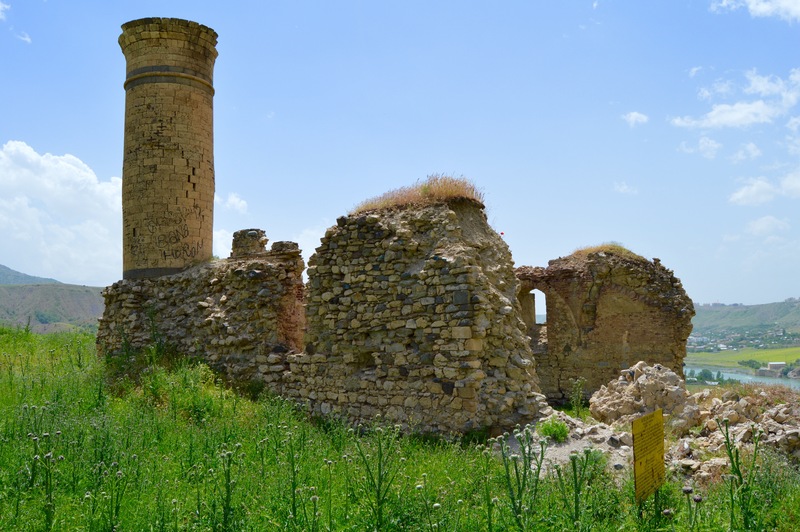 I had been looking around the ruins for about fifteen minutes when I met five or six workmen who had been resting nearby before resuming their task of restoring the hamam. One of the workmen kindly encouraged me to enter parts of the ruins not previously examined, then he invited me to join two of his colleagues for glasses of tea in a large portacabin that was where they slept at night. The portacabin was also their daytime retreat when the heat became oppressive or they wanted to eat a meal. They explained that, although it was a rather long walk to the citadel via a gently inclined road encircling the mountain on which it stands before turning into a path with stone steps, I should make the effort to see it. I would enjoy the views, some Urartian remains and a tunnel of unknown origin. I took their advice, but did not realise at the time that the walk would also lead to other ruins associated with Eski Palu. 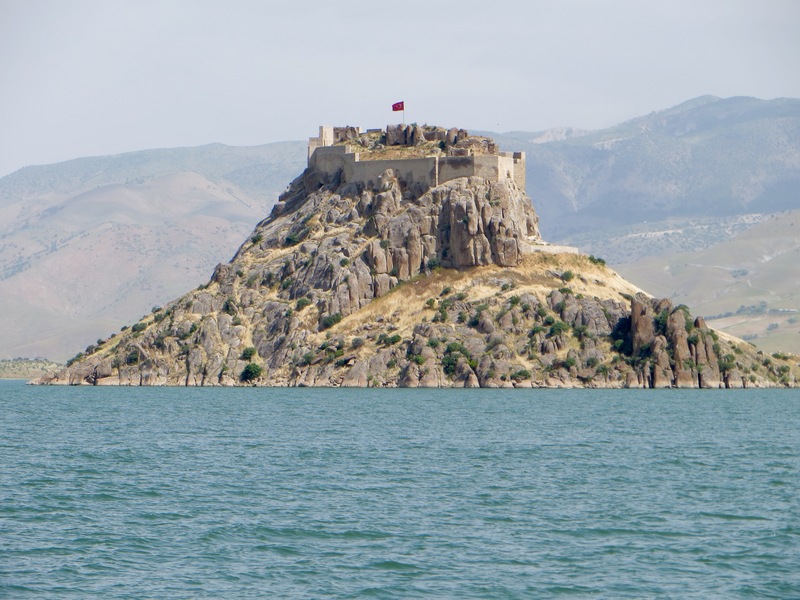 This entry was posted in Architecture, Travel, Turkey, Turkish Armenia, Turkish Kurdistan and tagged Alevis, Elazig, Eski Palu, ferry, Keban Reservoir, Kovancilar, Kucuk Camii, ogretmen evi, Palu, Pertek, Pertek Kale, railway, Termal Hotel by philandre. Bookmark the permalink.